I love Kroehler sofa's. 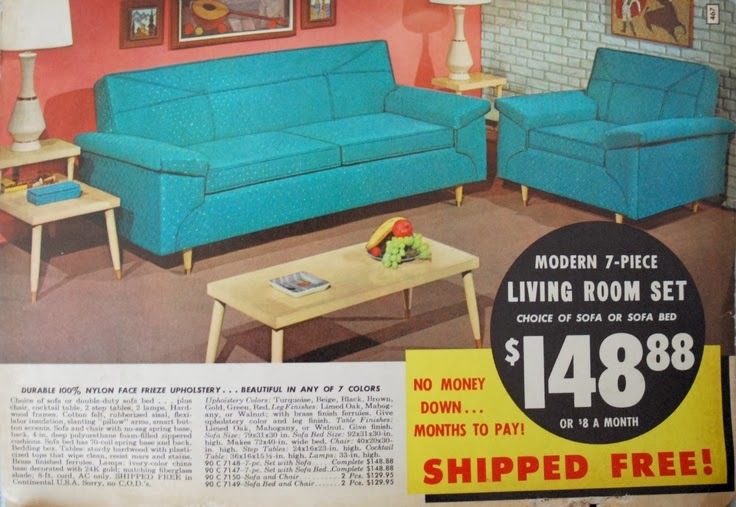 I love the years of their turquoise or pink sofa's, that were a huge staple of their inventory. My Granny had the pink three piece set in her old house. Which means... the house she had till I was around 5. Then she built her new home in 1972. And that house was a time capsule to 1972 when she passed away in 2003. Her colors in the new home. Lime Green and Sunny Yellow. It was divine. 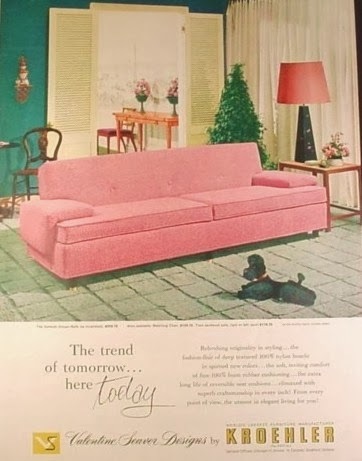 I have very distinct memories of her pink Kroehler furniture that was in her old house. She had the sofa, love seat... along with the matching chair and ottoman. I have been looking for a picture I know, I have, of me and my sister sitting in that pink chair. I ended up with the picture. But I can not find in it my mounds of genealogy stuff. No matter how I attempt to make a filing system for the genealogy collection. It is never in any decent order. 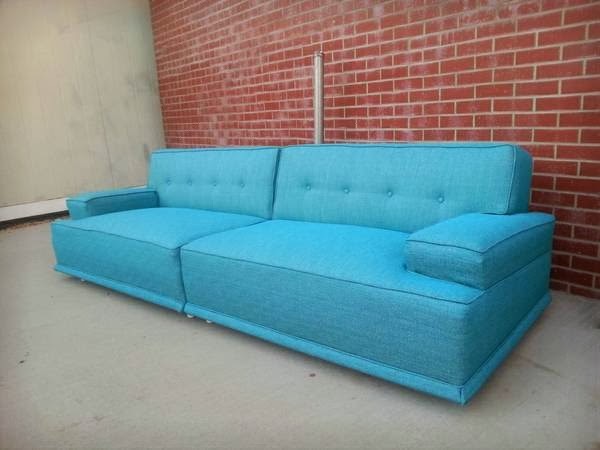 Anywho... what provoked me into this ramble about my love of Kroehler sofa's... this heavenly turquoise sofa. That is currently for sale in the Dallas Craigslist. My goodness that is just turquoise perfection. What a gorgeous piece of Mid Century furniture. So bold. Love the lines of the sofa. I have a great dislike for pillow back sofa's. It is a constant issue with those pillows looking distorted and sad within six months. While the rest of the sofa still looks crisp. Oh the joy I would have. If I walked into a new furniture show room and saw one of these beauties brand new and looking for a new home. My mom had one a lot like the first picture. In fact, she had the whole set. I don't know what happened to the end tables and coffee table but after I moved out and she bought new, she gave them to be. That sofa was the most comfortable sofa I have ever set on. It was good to sleep on, too. Hers was a sofa bed and when it was pulled out, it was comfy that way, too. Not like the ones they made in the 80's. I wish I still have that sofa and chair!! They really were a great piece of American made furniture. 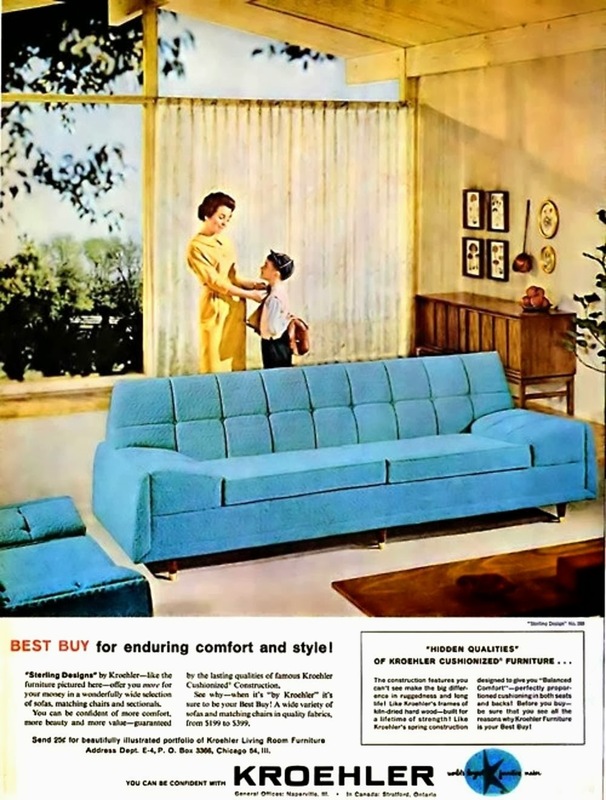 Which is why I love the older Kroehler sofa's. They were meant to last longer than 2 years. And they came in fabulous colors! Ah such lovely pictures to look at, reminisce and long for.